Gurgaon: It will take National Highways Authority of India (NHAI) a month and a half to acquire 24.03 hectares of land in the Bijwasan and Bamnoli areas of the capital to construct the incomplete 1km portion of the Dwarka expressway in Delhi. The authority issued a notification under the NHAI Act to ensure the process is completed without any hassle. Unlike acquisition of land under the Land Acquisition Act, land acquired under the NHAI Act cannot be challenged in court. 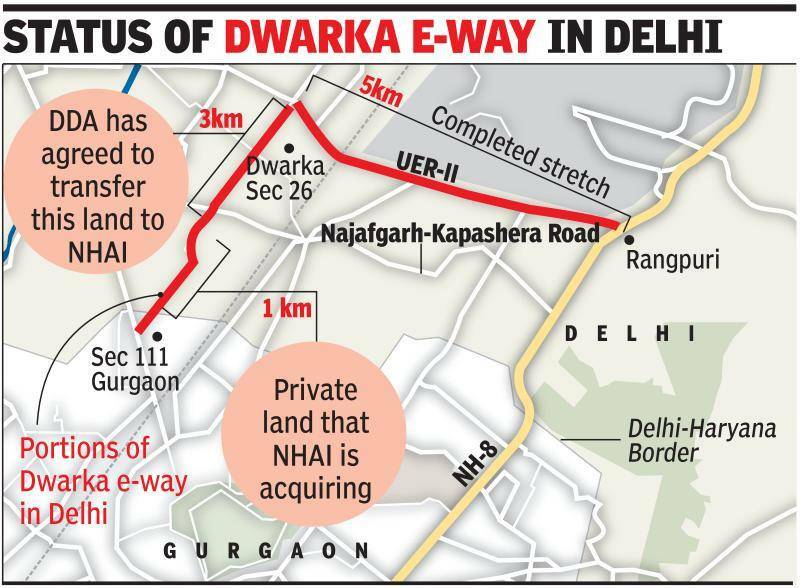 Of the 4km of Dwarka expressway that is incomplete, from Urban Extension Road II (UER-II) passing through Dwarka Sector 26 in Delhi till Sector 111 in Gurgaon, 3km is on Delhi Development Authority (DDA) land, while the remaining 1km, which is private land, has to be acquired by NHAI. To build this road, NHAI will acquire 24.03 hectares in Bijwasan and Bamnoli. “We have identified the land and hope to complete acquisition at the earliest,” said NHAI project director Ashok Sharma. The proposed 150m-wide Dwarka-Palam Vihar link, also known as Northern Peripheral Road or Dwarka expressway, which connects Dwarka in Delhi and NH-8 in Gurgaon, was envisaged 10 years ago and was to be ready before the Commonwealth Games 2010. The 27km-long road — 18km in Gurgaon and 9km in Delhi — has already missed six deadlines. The detailed project report for the Delhi portion of the expressway is being prepared by NHAI through consultant AECOM.